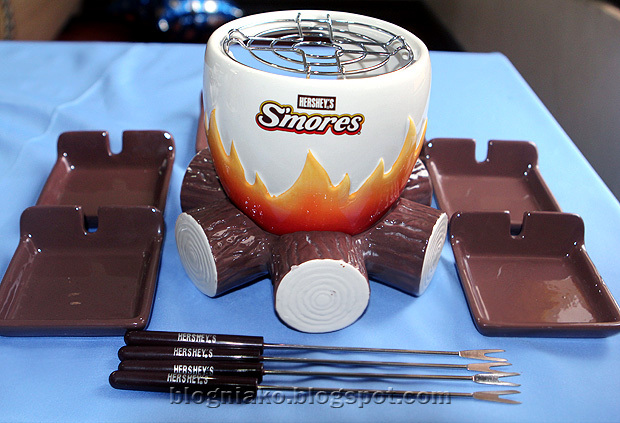 One of the things I’ve been meaning to buy is a S’more Maker Set just because I love S’mores! I actually purchased one a few months ago and this was the first time we’ve used it. The traditional s’more is made with toasted marshmallow, graham crackers and pieces of chocolate ( I prefer Hershey’s milk chocolate bar). I grew up not knowing about the existence of this yummy treat because it’s more popular in the United States but eversince I got a taste of this gooey piece of heaven, I got hooked! I already lost count how many times I posted about s’mores. I’ve introduced my nieces to S’mores a few years back and they all loved it! So recently, the kids had fun making melting snowman s’mores and to add more fun, I turned it into a mini competition. Whoever makes the cutest melting snowman s’more wins a prize! 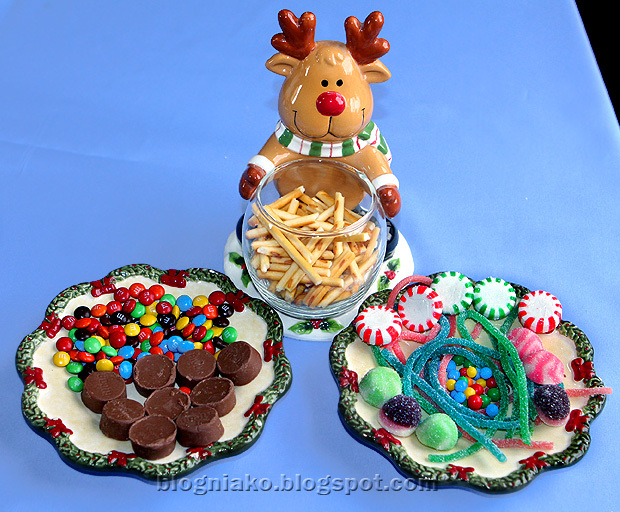 I saw the idea of making melting snowman s’mores online but the blog is private so I can’t link it. Sis, my cousin and my Aunt judged the kids’ creations. I let the judges out of the room while the kids were creating their masterpieces so they won’t be biased. I made a few melting snowman s’mores beforehand so the kids had an idea what to make. Instead of hershey’s chocolate bar, the kids used nutella. The alcohol gel lasted for 2 hours. I made it easy for the kids by preparing everything they needed. I premade the snowman heads adding details using black gourmet writer for the eyes and mouth and orange food color for the nose. The kiddos enjoyed putting these together! The kiddos with one of the judges. See you on our next s’more day! OMG those smores look so good! cuteness naman ng mga gamit parang naglalaro lang sila. you never stop amaze me with your ideas!! too cute to eat! 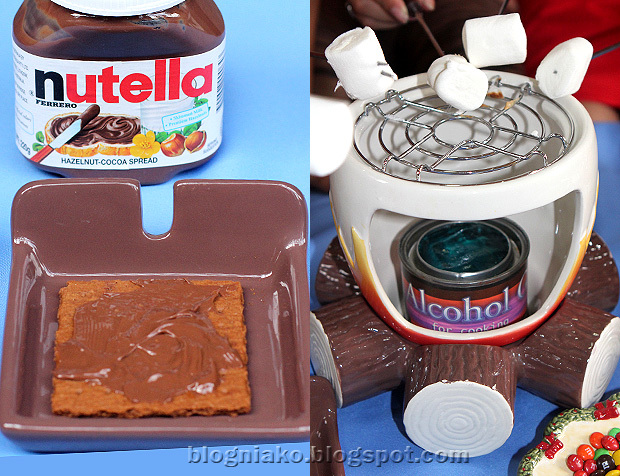 ang saya naman ng smores maker set! wow, kakainggit ang talent ng mga chikiting. Parang namana ata ang pagiging artist ng Tita Aney nila. cute ng mga kids and they're lucky to have modified shabu-shabu… happy holidays! WOW! MAkalaglag panga naman tong s'mores mo! Where did you bought the S'more maker?! I want that tooo! I super love your nieces, supah model lang ang mga peg! Love 'et! ang saya-saya talaga jan sa inyo lagi 🙂 that is really a nice activity with the kids. na-encourage pa ang kanilang creativity! very creative ng mga kiddos sis, pwede na sila i join sa junior chef, he he..
grabeh! ang sarap sarap naman non. kahit matandang tulad ko natatakam. Grabe nakakapaglaway ang mga chocolate lalo yung choco drink. nagmana sau ng pagka-creative ang mga pamangkin mo..puro ba talaga girls ang mga pamangkin mo oh hindi lang kasali ang mga boys dito? Wonderful photos, I love the delicacy that you get with this portraits. Oooo…awesome! So cute. A Blessed Christmas to you and your loved ones and a Happy 2013! Sarap mo maging tita!. Anney, gusto kita gawing ninang ng anak ko! kahit sa boy scout! ang cute ng melting snowman, creative narin ung mga niece mo! Merry X'mas and a Happy New Year for you and your love ones…, Anney. The smores of the girl who won first prize is also my favorite. Wow! San nabibili yan? Haha. Silly me, am actually not aware of that.